I looove soups. I discovered them when I was about 12. At that age I decided it’s time to diversify my menu (which consisted of pizza) and to really get into chicken soup. With a lot of ground black pepper on it. That’s a big step for a 12 year old. But since taking that step I never looked back. And these days I actually started looking forward. Forward to a soup without chicken. To a soup with lentils and quinoa – a soup that is light, warming and comforting. A soup that will be my best friend when I need a warm hug during winter. A soup that will boost my immune system, when it’s down. A soup that will be ready in 20 minutes and won’t require all my attention. It is pretty much a little health bomb – with onions, fresh broccoli, ginger and carrots it’s perfect for detoxification and you won’t have to pay for detox with the price of being hungry. This soup is satisfying, heart-warming and you don’t need to be a genius to make it. Besides by eating it you can prevent a number of nasty diseases – the whole spectrum – from colds to cancer. 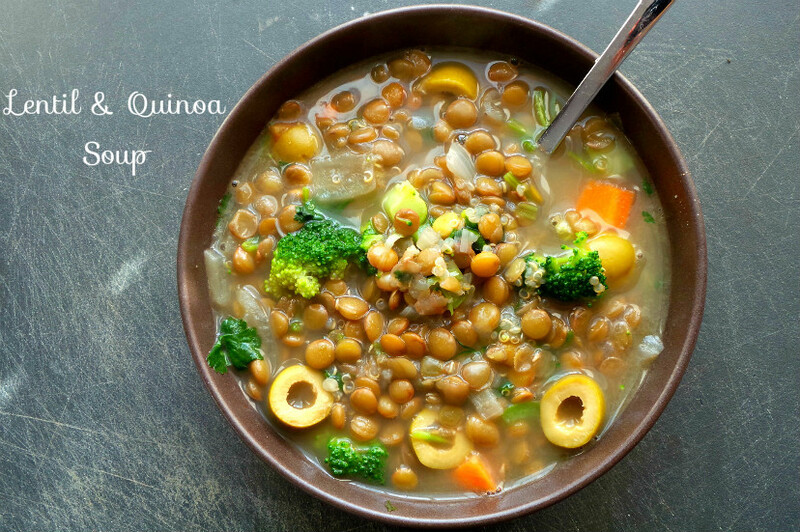 This detoxifying lentil quinoa soup is easy to make and will warm your heart! Cook lentils and quinoa with 3 cups water in a deep pot - at first at high temperature, bring to a boil (lid covered) and set to medium high. In the meantime chop the vegetables. After about 5 minutes cooking add chopped onion, ginger, salt and olive oil to the soup. After additional 5-7 minutes the quinoa and lentils should already be cooked (tender). Turn off heat, add all the other ingredients and cover the lid of the pot for about 1 minute. Serve with a few olives if you'd like.